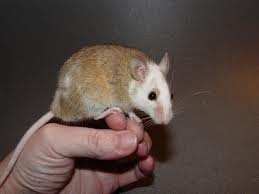 About the size of an adult gerbil, the soft fur rat is easily tamed with frequent handling and as mentioned earlier since you won't have to spend as much time cleaning their housing you will have more time to be able to spend time playing with it. I don't recommend this little guy for young children unless they are carefully supervised due to them being easily startled which can lead to being bitten (as with any animal). Soft fur rats can not handle the cold, they come from a warm climate and need warmth to thrive. 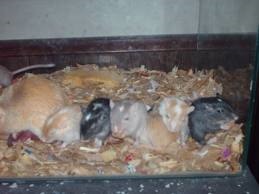 They are not happy if they do not have other soft fur rats with them, the more in your group, the better but the advised ratio is at least two. If you are breeding them to sell or feed to reptiles the ideal ratio is one male to 2 females, a male will drive a female crazy trying to breed and that can seriously effect their health. Soft fur rats are able to breed at only 2 months old! They can have as few as 6 and as many as 22 babies per litter! Fruits and vegetables should be at least 1/3 of their diet as well as a good quality rodent pellet type food. They live in large colonies in the wild and they are happier in larger colonies though just keeping a couple is acceptable. The best way to pick up a soft fur rat is by the base of it's tail, they are more apt to nip or bite when grasped from behind. Their gestation period is approximately 21 days. They love to climb so a wire cage is great, the bigger the better because they need room to run, jump and climb. Hiding places are a necessity not an option. Soft fur rats are strictly nocturnal, you will rarely see them out in the day. Make sure fresh food and water is available at all times, they are very active and there for have a high metabolism so they eat and drink frequently while active during their night time play. Females in a colony help raise each others young so there is no need to remove a pregnant female from the group.